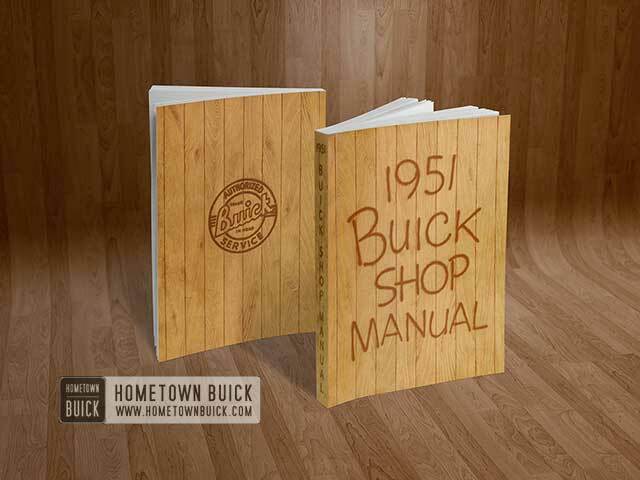 The 1951 Buick generating system restores to the battery the energy used in cranking the engine. It also supplies current to carry the electrical load of the ignition, lights, signaling devices, and accessories, at operating speeds above 25 MPH up to the limit of the generator’s capacity. At speeds below 25 MPH the output of generator is not sufficient to carry the electrical load of all units, therefore the battery supplies the additional current required. The 1951 Buick generating system consists of the generator (par. 10-24), generator regulator (par. 10-25), charge indicator, battery (par. 10-14), the wires and cables connecting these units, and the battery ground cable and ground through engine crankcase which completes the circuit. See figure 10-14. The charge indicator indicates charging current going into the battery and the current leaving battery, except when cranking the engine or blowing the horn. The charge indicator does not indicate charging rate of generator since current supplied by generator to electrical units other than the battery and horns does not pass through the indicator. 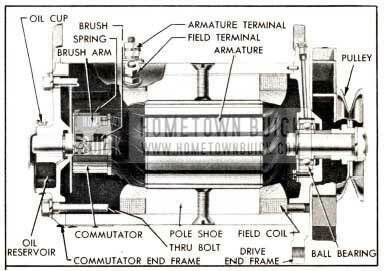 The 1951 Buick generator is a two-brush, two-pole shunt wound unit which is capable of delivering 40 amperes when hot. The maximum output of generator is controlled by the current regulator; however, the generator does not normally deliver the maximum output because the voltage regulator controls output in accordance with the requirements of the battery and the current consuming units in operating. See figure 10-12. The 1951 Buick generator pulley drives a fan which draws a draft of air through the generator to carry away the heat produced during operation. This ventilation permits the 1951 Buick generator output to be increased to higher values than would be possible in a non-ventilated generator of the same size. The armature shaft is supported by an annular ball bearing in the drive end frame and a bronze bushing in the commutator end frame. The bearing and the bushing are provided with hinge cap oil cups for periodic application of a few drops of light engine oil. The two brushes are mounted on a brush plate attached to the commutator end frame and are held in contact with the commutator by spring loaded brush arms. One brush is grounded to the frame while the other brush is insulated from the frame and connected to the field coils and the armature terminal post (“A”) on the field frame. The two field coils are held in place by two pole shoes which are attached to the field frame by large screws. See figure 10-11. The generator is suspended oil a bracket on left side of crankcase and is driven by the fan belt. The method of mounting permits generator to be moved in or out to adjust tension of fan belt. The high output rating of the 1951 Buick generator used on all series eliminates the need for special service generators except for certain police installations where unusual low speed performance is required. Delco-Remy has available through United Motors Service, a generator package suitable for this kind of installation. The generator regulator is mounted on the left front fender skirt and is cushioned by rubber to dampen the noise which is caused when the regulators operate. The regulator is grounded to the fender skirt through two of the attaching bolts, and to insure positive ground the base of regulator is also connected by a wire to the generator frame. The generator regulator contains a cutout relay, current regulator, and voltage regulator, all mounted on one base and enclosed by a sheet metal cover. See figure 10-13. 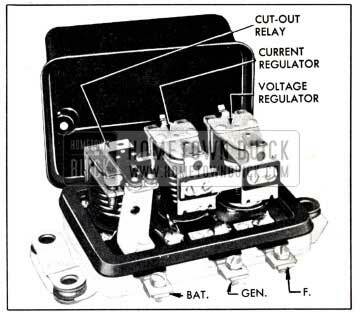 The 1951 Buick cutout relay opens the circuit to prevent the battery from discharging to ground through the generator whenever the engine is stopped or generator is operating at such low speed that its voltage is less than voltage of battery. When the voltage of generator is slightly greater than battery voltage the relay closes the circuit so that generator can furnish current to the electrical system. 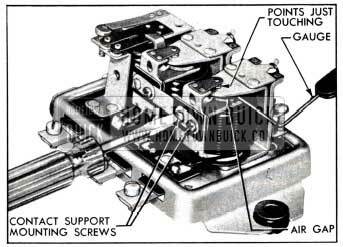 The 1951 Buick cutout relay has a series or current winding of a few turns of heavy wire, and a shunt or voltage winding of many turns of fine wire, both assembled on the same core. The shunt winding is connected between generator armature and ground so that generator voltage is impressed upon it at all times. The series winding is connected so that all generator output current must pass through it. It is connected to a flat steel armature which has a pair of contact points through which current passes to the battery and other electrical units. The contact points are held open by armature spring tension when the unit is not operating. See figure 10-14. 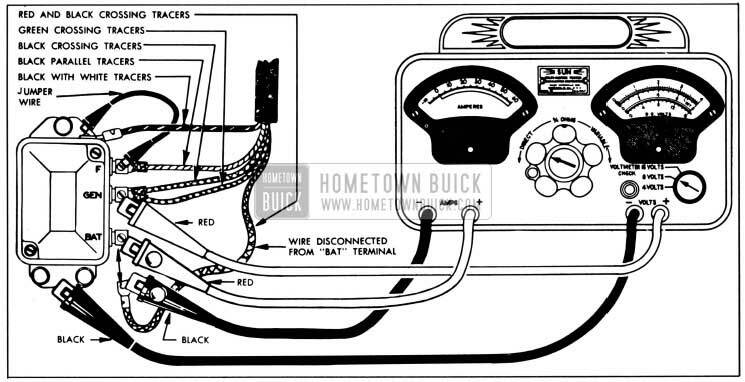 When the 1951 Buick generator begins to operate, voltage builds up and forces current through the shunt winding, thereby magnetizing the core. When the voltage reaches the value for which the relay is set, the magnetism is strong enough to overcome the armature spring tension and pull the armature toward the core, thereby closing the contact points. Generator current now flows through the series winding of relay in the right direction to add to the magnetism holding the points closed, and passes on to the battery and other electrical units in operation. 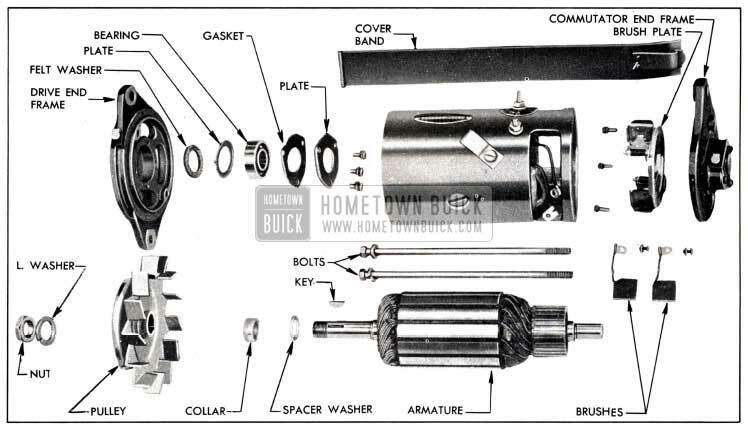 When the 1951 Buick generator slows to engine idling speed, or stops, current begins to flow from the battery back through the generator, reversing the current flow through the series winding. This reduces the magnetism of the relay core to the extent that it can no longer hold the contact points closed against armature spring tension. The points are separated and the circuit broken between the generator and battery. The 1951 Buick current regulator automatically controls the maximum output of the 1951 Buick generator. When the current requirements of the electrical system are large and the battery is low, the current regulator operates to protect the generator from overload by limiting its output to a safe value. 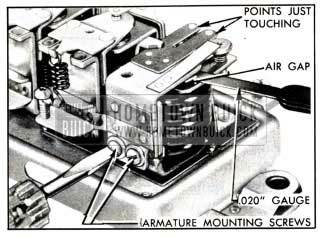 The 1951 Buick current regulator has one series winding of heavy wire through which the entire generator output flows at all times. This winding connects to the series winding in the cutout relay, described above. Above the winding core is an armature, with a pair of contact points which are held together by spring tension when the current regulator is not operating. When current regulator is not operating and the contact points are closed, the generator field circuit is directly grounded so that generator may produce maximum output, unless further controlled by the voltage regulator described below. See figure 10-14. When the 1951 Buick generator output increases to the value for which the current regulator is set, the magnetism of the current winding is sufficient to overcome the armature spring tension. The armature is pulled toward the winding core so that the points are separated. The generator field circtt.it must then pass through a resistance, which reduces the flow through the field coils and thereby reduces the output of generator. This reduces the magnetic strength of the current winding so that spring tension again closes the contact points, directly grounding the generator field circuit and increasing generator output. This cycle is repeated 150 to 250 times a second, and the action limits the generator output to the value for which the regulator is set. The current regulator has a bi-metal hinge on the armature for thermostatic temperature control. This automatically permits a somewhat higher generator output when the unit is cold, and causes the output to drop off as the temperature increases. The current regulator operates only when the condition of battery and the load of current-consuming units in operation require maximum output of the generator. When current requirements are small, the voltage regulator controls generator output. Either the current regulator or the voltage regulator operates at any one time; both regulators never operate at the same time. The 1951 Buick voltage regulator limits the voltage in the charging circuits to a safe value, thereby controlling the charging rate of the generator in accordance with the requirements of the battery and the current-consuming electrical units in operation. When the battery is low, the generator output is near maximum but as the battery comes up to charge, and other requirements are small, the voltage regulator operates to limit the voltage, thereby reducing the generator output. This protects the battery from overcharge and the electrical system from high voltage. 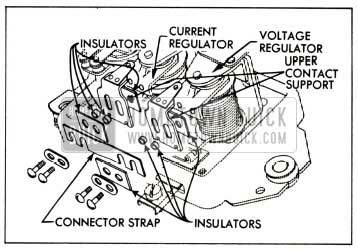 The 1951 Buick voltage regulator consists of two windings assembled on the same core, an armature and a set of contact points, and a fixed resistance. 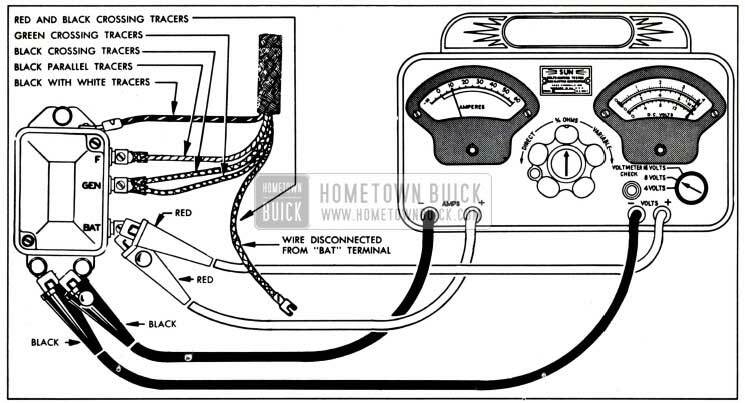 The voltage winding consists of many turns of fine wire connected so that 1951 Buick generator voltage is impressed on it at all times. The series winding, having a few turns of heavy wire, carries the generator field current directly to ground when the regulator contact points are closed. A contact point on the armature, which is located above the winding core, is held in contact with a stationary contact point by armature spring tension when the voltage regulator is not operating. See figure 10-14. 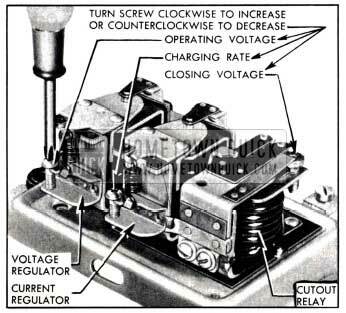 When the 1951 Buick generator voltage reaches the value for which voltage regulator is set, the combined magnetic pull of the voltage and series windings is sufficient to overcome the armature spring tension, so that the armature is pulled toward the core and the contact points are separated. The instant the points separate, the field current flows to ground through the resistance. This reduces the current flow through the field coils and decreases generator voltage and output. As soon as the field current stops flowing through the series winding, the magnetic pull of this winding collapses. In addition, the reduced voltage in the circuit causes a weakening of the magnetic field of the voltage winding in the regulator. The resulting loss of magnetism permits the springs to pull the armature away from the core and close the contact points again, thereby directly grounding the generator field so that generator voltage and output increases. This cycle is repeated 150 to 250 times a second, causing a vibrating action of the armature, and holds the voltage to a constant value. By maintaining a constant voltage, the voltage regulator continues to reduce the generator output as the battery comes up to charge. When the battery reaches a fully charged condition, the voltage regulator will have reduced the generator output to a relatively few amperes. The voltage regulator has a bi-metal armature hinge for thermostatic temperature control. This automatically permits regulation to a higher voltage when the unit is cold, and a lower voltage when hot, because a high voltage is required to charge a cold battery. As previously stated, the current and voltage regulators do not operate at the same time. When current requirements are large, the generator voltage is too low to cause voltage regulator to operate, therefore the current regulator operates to limit maximum output of 1951 Buick generator. When current requirements are small, the generator voltage is increased to the value which causes voltage regulator to operate. The generator output is then reduced below the value required to operate the current regulator, consequently all control is then dependent on the operation of voltage regulator. The current and voltage regulator circuits use a common resistance which is inserted in the field circuit when either regulator operates. A second resistance is connected between the regulator field terminal and the relay base, which places it in parallel with the generator field coils. The sudden reduction in field current occurring when either the current or voltage regulator contact points open, is accompanied by a surge of induced voltage in the field coils as the strength of the magnetic fields change. These surges are partially dissipated by the two resistances, thus preventing excessive arcing at the contact points. As a general rule, the 1951 Buick generator should be inspected and tested every 5000 miles to determine its condition; however, the type of service in which some generators are used may make more frequent inspection advisable. High speed operation, excessive dust or dirt, high temperatures and operation of generator at or near full output most of the time are all factors which increase bearing, commutator and brush wear. The following inspection will disclose whether the 1951 Buick generator is in proper condition for service or in need of removal for repairs. Remove commutator cover band and inspect it for thrown solder. Thrown solder indicates that the generator has overheated, probably from excessive output. Since thrown solder results in loose or broken connections between armature windings and commutator riser bars, which usually causes burned commutator bars, the generator must be removed for repairs. (Par. 10-28). Inspect commutator. If it is rough, worn, out of round, or has high mica between the bars it will require turning down and undercutting of the mica. Generator must be removed for this work. Check condition of brushes; make sure they are not binding in holders and that they are resting on the commutator with sufficient tension to give good, firm contact. Brush leads and screws must be tight. If the brushes are worn down to one-half their original length, compared with new brushes, the generator must be removed for installation of new brushes. CAUTION: When inspecting brushes do not pull them out of holders against spring tension by pulling on brush leads. This may loosen the leads in brushes, causing excessive resistance, heating and open circuits to develop. Do not snap brush arms down on brushes as this may chip or crack them. If commutator and brushes are in good condition but dirty, they can be cleaned without removal of 1951 Buick generator. Clean off any grease with a cloth soaked with carbon tetrachloride or other non-inflammable solvent. While engine is running, polish commutator with a brush seating stone or with a strip of 2/0 sandpaper placed over a wooden block having a smooth square end. Never use emery cloth, because it will cause arcing, burning and rapid wear of commutator and brushes. After cleaning commutator blow out all dust from generator. Check fan belt for condition and proper tension (fig. 10-15), and make certain that all generator mounting bracket and brace bolts are tight. A loose fan belt will permit belt slippage, resulting in rapid belt wear and low or erratic generator output. An excessively tight belt will cause rapid belt wear and rapid wear of generator and water pump bearings. NOTE: lf belt requires adjustment, first loosen belt so that pulley is free, then check pulley for tightness and check generator bearings for freeness of rotation and excessive side play. Tight or excessively worn bearings should be cleaned or replaced. Inspect and manually check all wiring connections at 1951 Buick generator, regulator, charge indicator, and cranking motor solenoid switch to make certain that connections are clean and tight. Clean any loose connections before tightening, to insure good contact. Inspect wiring for broken insulation, broken strands, and loose terminals. Make any corrections necessary to eliminate excessive resistance. After the inspection given above it is advisable to test the 1951 Buick generator for output and the circuit wiring for excessive resistance. Before making the following tests make certain that battery specific gravity is not less than 1.250. Disconnect wire from generator regulator terminal marked “BAT” and connect an ammeter in series with this terminal and the disconnected wire. Connect jumper wire between regulator terminal marked “F” and base plate of regulator so that current and voltage regulators cannot operate to control generator output. Start engine and with all electrical units turned off slowly increase engine speed until ammeter registers 40 amperes, which should be reached at approximately 1250 RPM of engine when generator is HOT, or at slightly lower speed when generator is cold. CAUTION: Do not exceed 1400 RPM of engine while “F” terminal is grounded. 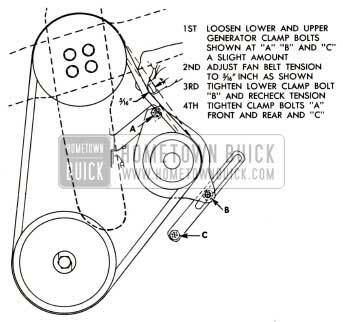 If 40 amperes cannot be obtained at approximately 1250 RPM of engine check fan belt for proper tension (fig. 10-15). If fan belt is not slipping the generator does not have proper output. Remove generator for bench test (par. 10-27) and make necessary corrections before attempting any adjustment of generator regulator. Slowly increase engine speed until ammeter registers 20 amperes and note engine speed at this point, then stop the engine. Disconnect ammeter and reconnect loose wire to “BAT” terminal of regulator. Leave jumper wire connected between “F” terminal and regulator base. Momentarily bridge between “F” and “GEN” terminals of regulator to polarize the generator. Connect a voltmeter negative (-) lead to the battery positive (+) terminal and connect voltmeter positive (+) lead to the “A” terminal of generator. Start engine and slowly open throttle until engine speed is the same as when 20 amperes was obtained in step 5. At this point note voltmeter reading. The voltmeter indicates the voltage drop in the generator to battery wiring. If the reading is greater than .8 volt there is excessive resistance at some point in this circuit. The cause of high resistance must be located and eliminated to insure proper charging of the battery. Disconnect voltmeter and remove jumper wire. The following inspection and test of generator, after removal from car, may be used to determine the cause of unsatisfactory output before generator is disassembled. Remove cover band and inspect condition of brushes and commutator as described in paragraph 10-26. If brushes and commutator are in satisfactory condition and the cause of trouble is not apparent proceed to the following steps. Place piece of cardboard between commutator and grounded brush. Using test lamp and points, check for grounds with test points on “A” terminal and generator frame. If lamp lights, the generator is internally grounded. Locate the ground by insulating the other brush also, and checking the brush holders, armature, commutator and field separately. If generator is not grounded, check the field for open circuits by placing one test lamp point on the “F” terminal and the other point on the brush holder to which the field is connected. If lamp does not light the field has open circuit. If the open circuit is due to a broken lead or bad connections, it can be repaired but if the open circuit is inside one of the field coils the coil must be replaced. If the field is not open, check for a short circuit by connecting a 6-volt battery and an ammeter in series with the field coils. Proceed with care since a shorted field may draw excessive current which might damage the ammeter. An ammeter reading of 1.90 to 2.05 amperes indicates that field is satisfactory; a higher reading indicates a short circuit. If the cause of trouble has not been located, disassemble generator for test of armature (par. 10-28). If a shorted field is found be sure to check for burned contact points in the generator regulator as described in paragraph 10-29 (b). A shorted field may permit an excessive field current which could burn the regulator points. The generator brushes may be replaced without disassembling the generator, but all other internal repairs require disassembly. If commutator has burned bars or is worn eccentric, new brushes will wear out very quickly if commutator is not trued up at time brushes are installed. When inspecting or replacing generator brushes, do not pull them out of their holders against spring tension by pulling on the brush leads. This may loosen the leads in the brushes, causing excessive resistance, heating, and open circuit to develop. Do not snap brush arms down on brushes as this may chip or crack them. Make sure that brushes are free in the holders and that springs have proper tension. Excessive tension will cause rapid brush and commutator wear, and low tension will cause arcing and burning of brushes and commutator. Hook a spring scale on end of brush arm and measure pull required to just lift arm off brush, pulling at right angle to brush arm. Tension should be 24 to 32 ounces, and may be adjusted by bending the brush spring as required. Be sure that spring tension has not been lost due to overheating. New brushes must be seated to make good contact with armature, using a brush seating stone. This is a soft abrasive material which, when held against a revolving commutator, disintegrates so that particles are carried under the brushes and wear their contracting faces to the contour of the commutator in a few seconds. Blow all dust out of generator after the brushes are seated. When it is necessary to disassemble generator for any reason, make a complete clean up and test to make sure all parts are in satisfactory condition. See figure 10-16 for identification of parts. Remove commutator cover band, disconnect leads at brushes and remove brushes. Unscrew through bolts and remove the commutator end frame and field frame. Hold armature in vise equipped with soft jaws, and avoid excessive tightening of vise. Remove pulley nut, lock washer, pulley, fan, key, collar, and drive end frame from armature shaft. Remove spacer washer. Remove bearing retainer plate, gasket, bearing, plate and felt washer from drive end frame. Thoroughly clean and inspect the ball bearing as described under Bearing Service (par. 1-11 and 1-12), and if satisfactory for use, pack it with high melting point ball bearing grease. Replace worn or rough bearing. Remove dust cap from commutator end frame and clean out oil reservoir. Make sure that vent hole in dust cap is open. Install dust cap with new gasket. Clean all other parts by wiping with clean cloths. The armature and field coils must not be cleaned in any degreasing compound since this might damage insulation so that a short or ground would subsequently develop. If field coils are to be removed from frame, a pole shoe spreader and pole shoe screwdriver should be used to avoid distortion of frame. See figure 10-55. Carefully inspect all parts for wear or damage and make necessary repairs, or replace unserviceable parts. Any soldering must be done with rosin flux; never use acid flux on electrical connections. If brush springs are distorted or show evidence of overheating, replace them. Before making any repairs to the armature, test it for open, shorted or grounded circuits. Open circuits in armature are usually obvious since the open circuited commutator bars are usually burned as a result of arcing as they pass under the brushes. 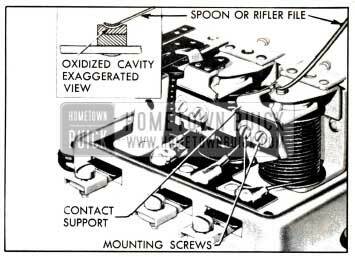 If 1951 Buick generator has overheated and thrown solder, the open circuit will be at connections to commutator riser bars. Repairs can be effected by resoldering leads to riser bars, using rosin flux. Check armature for short circuits by placing it on a growler and slowly turning armature while holding a thin strip of steel (hacksaw blade) above armature core. The steel strip will vibrate when above the area of armature core in which any short circuited coils are located. Copper or brush dust in slots between commutator bars may cause shorts between bars which can be eliminated by cleaning out the slots. Shorts at cross-over of coils at the drive end can often be corrected by bending the wires slightly and reinsulating the exposed bare wire. Test for grounds, using test lamp and points, by placing one test point on armature core and the other test point on commutator. If lamp lights, the armature is grounded. If grounds are at points where coils come out of slots in core, repairs can be made by placing insulating strips between core and coil which is grounded. If armature is otherwise satisfactory but commutator is worn, burned, out of round, or has right high mica between bars, the commutator should be turned true in a lathe. After turning, undercut mica 1/32″, then carefully clean all dirt and copper dust out of slots. Lightly polish the commutator with 2/0 sandpaper to remove any slight burrs left by undercutting operation. Assemble 1951 Buick generator by reversing disassembly procedure. If field coils were removed, use pole shoe spreader and pole shoe screwdriver to install them, to avoid distorting frame and to insure proper tightening of pole shoe screws. See figure 10-55. The 1951 Buick generator regulator should be tested only when difficulty is experienced in keeping the battery charged, or when battery uses an excessive amount of water, which is usually caused by a high charging rate. Before testing the generator regulator make certain that the generator and circuit wiring are in good condition by performing the inspection and test given in paragraph 10-26. The “Fixed Resistance” method of testing the operation and calibration of the generator regulator is recommended in preference to the “Variable Resistance” method which employs a variable resistance connected in series between the generator regulator and the car battery. The “Fixed Resistance” method uses a calibrated fixed resistance in place of the car battery, therefore it eliminates the effect that battery condition may have on operation of the regulator units. All tests can be made without removing regulator cover, therefore proper regulator temperature can be maintained during tests. The procedures given below in subparagraph c (using Sun Model CB tester) and subparagraph d (using Allen Model E-302 tester) provide “Fixed Resistance” methods of testing the generator regulator. CAUTION: When making connections or doing other work on the generator regulator stop the engine to avoid injury from the fan. When engine is running be very careful to keep hands and equipment clear of the fan. After any test or replacement of regulator, the car generator must be polarized after all wires are connected but before engine is started. Failure to polarize generator may result in severe damage to the equipment since reversed polarity causes vibration, arcing and burning of the relay contact points. 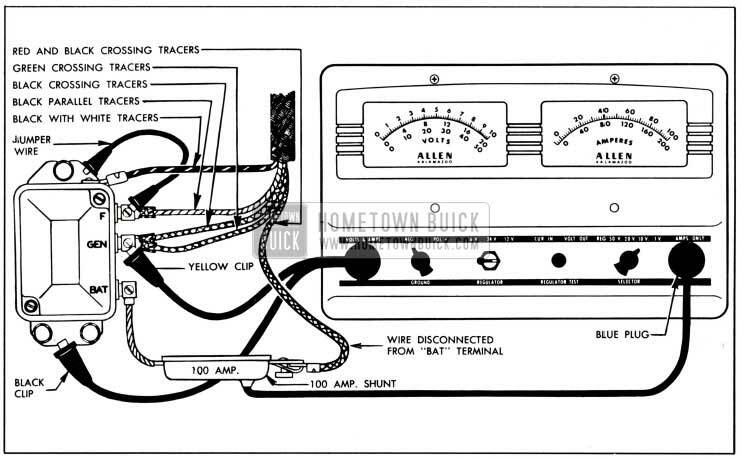 The generator may be readily polarized by momentarily bridging between the “BAT” and “GEN” terminals of regulator to cause a surge of current through the 1951 Buick generator. Always make certain that rubber gasket is in proper position to seal regulator cover when installed. The gasket prevents entrance of dust, moisture, and oil vapors which might damage the regulator. IMPORTANT. Mechanical checks and adjustments, such as air gap and point opening, must be made with battery disconnected from regulator and preferably with regulator removed from car. The calibration of the test voltmeter should be frequently checked and should always be checked immediately following malhandling, sluggish movement of pointer, or when the meter has been dropped. Select a satisfactory new 6-volt automotive storage battery and charge slowly (1 amp. per positive plate) until fully charged. Specific gravity of electrolyte should read between 1.275 and 1.290 in all cells. Allow battery to stand over night at approximately 80°F. for stabilization of voltage. Battery terminal voltage will then be 6.4 volts. CAUTION: Do not use battery for calibration immediately after charging because battery voltage will be abnormally high for several hours. Check the test voltmeter against prepared battery and note reading. If meter does not read 6.4 volts, calculate the difference. Assume that error will be the same between 7.2-7.7 volts and allow this difference when using voltmeter to test and adjust 1951 Buick generator regulator. If voltmeter is found faulty, it should be repaired at first opportunity. The prepared calibrating battery also may be used to check an open circuit type battery testing meter by measuring the voltage of one cell, which will be 2.13 volts. The following procedure covers use of the Sun Volts Ampere Tester, Model CB, in making tests and adjustments of the cutout relay, voltage regulator and current regulator in the order named. REGULATOR COVER MUST BE IN PLACE DURING ALL TESTS. While looking squarely at voltmeter dial, press the “VOLTMETER CHECK” button and note whether the voltmeter needle aligns with the “SET” line. See figure 10-17. With check button depressed, the voltmeter is disconnected from any external circuit and is connected across an extremely accurate internal test cell which checks its calibration within the range required for testing the voltage regulator. 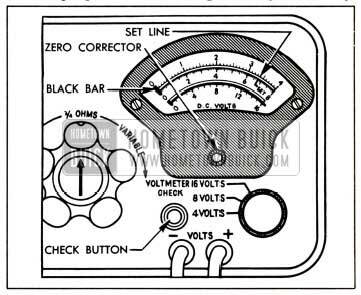 If voltmeter needle does not exactly align with the “SET” line, hold “VOLTMETER CHECK” button depressed and adjust the Zero Corrector to bring voltmeter needle into exact alignment with “SET” line. See figure 10-17. When “VOLTMETER CHECK” button is released, the voltmeter needle must return to the black bar at left edge of scale; otherwise, the meter is faulty and cannot be used for the generator regulator tests which follows. Connect a reliable tachometer to indicate engine speed. Knob of Volts Ampere Tester and rotate knob counterclockwise to the stop in “DIRECT” position. Turn voltmeter Selector Switch to the “8 VOLT” position. See figure 10-18. With engine stopped, disconnect wire from regulator terminal marked “BAT”, connect the black ammeter test clip to the disconnected wire, and connect the red test clip to the regulator “BAT” terminal. See figure 10-18. Connect the red voltmeter test clip to the “GEN” terminal of regulator and connect the black voltmeter test clip to ground on base plate of regulator. See figure 10-18. Connect jumper wire between terminal marked “F” and ground on base plate of regulator so that voltage regulator cannot operate. This is advisable because an improperly adjusted voltage regulator may prevent the cutout relay from closing. Start engine and warm it up until it is running on slow idle and adjust speed to 350 RPM. CAUTION: Never run engine faster than 1400 RPM with “F” terminal grounded. A higher speed may cause damage to 1951 Buick generator. Increase engine speed to 1250 RPM. Ammeter should read approximately 40 amperes. If it does not, fan belt is slipping or generator does not have proper output. These conditions must be corrected before further tests. From slow idle, slowly increase engine speed and note voltmeter reading at the instant that cutout relay contacts close, indicated by movement of ammeter hand from zero. The voltmeter will read between 5.9 and 6.8 if closing voltage of relay is correctly adjusted. Gradually increase engine speed until generator is charging approximately 5 amperes. Slowly reduce speed until relay contacts open, as indicated by ammeter hand returning to zero. Contacts should open on reverse or discharge current; if contacts open when ammeter shows charge it indicates a shorted relay winding requiring replacement of regulator. If ammeter does not return to zero after showing discharge current the relay contacts are sticking, requiring removal of regulator and adjustment of air gap (par. 10-30). If cutout relay operation is otherwise satisfactory but closing voltage is not between 5.9 and 6.8, remove regulator cover and adjust relay armature spring tension to obtain closing voltage of 6.4. Adjusting screw has a left-hand thread, therefore turning screw clockwise increases spring tension and closing voltage; turning screw counterclockwise decreases closing voltage. See figure 10-20. After adjustment, install cover and recheck closing voltage. CAUTION: Never close relay contacts by hand with batter y connected to regulator because this will cause a damaging high current flow through regulator units. After cutout relay closing voltage is correctly adjusted, shut off engine. Remove jumper wire from “F” terminal of regulator but leave all tester leads connected for the following tests. Start engine and increase speed to approximately 1500 RPM. Run engine for at least 15 minutes to permit the regulator to reach operating temperature. CAUTION: Since the voltage and current regulators are compensated for temperature, the following tests must be mad e with regulator at operating temperature to insure accurate results. When regulator reaches operating temperature, stop the engine. Turn tester Control Knob to the “3/4 OHMS” position. Change red voltmeter test clip from the “GEN” to the “BAT” terminal of regulator, where red ammeter test clip is already connected. Disconnect black ammeter test clip from car battery wire and connect it to good ground on regulator base plate. See figure 10-19. CAUTION: Do not allow disconnected car battery wire to touch metal. Start engine and increase speed to approximately 1500 RPM. Cycle the regulator by gradually reducing engine speed until cutout relay contacts open, then bring engine speed back to approximately 1500 RPM. The voltmeter reading will indicate the operating voltage, which will be between 7.2 and 7.7 if voltage regulator is properly adjusted. 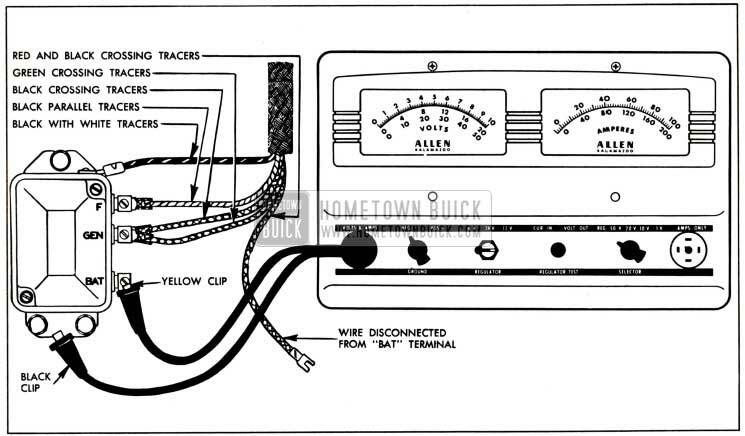 The ammeter will show a 1951 Buick generator charging rate of 8 to 10 amperes. Immediately following the voltage regulator test, proceed to the following current regulator test while the regulator is still at operating temperature. Increase engine speed to 2000 RPM, then depress the release button on the tester Control Knob and rotate the knob clockwise in the “VARIABLE” range until the voltmeter reads between 6 and 6.5 volts, then note ammeter reading. Ammeter will read 40-46 amperes if the current regulator is properly adjusted. Abnormal fluctuation of voltmeter or ammeter pointer during above test of voltage or current regulator indicates an oxidized condition of regulator contact points, which would cause high resistance in generator field circuit and reduce generator output. In this case, make the following test for oxidized contact points. Turn tester control knob to the stop in “DIRECT” position and connect the black ammeter test clip to the disconnected car battery wire. Turn on headlights and set engine at speed which produces approximately 5 amperes output. Ground the “F” terminal of regulator and note ammeter reading. If output increases more than 2 amperes when “F” terminal is grounded, contact points are oxidized and should be cleaned (par. 10-30). If contact points are in satisfactory condition but either the voltage or current regulator did not operate within specified limits, adjust armature spring tension as required. Turn adjusting screw clockwise to increase operating voltage or charging rate; turn counterclockwise to decrease operating voltage or charging rate. See figure 10-20. The final setting must always be made by turning screw clockwise to increase voltage or charging rate never by turning screw counterclockwise. Adjust voltage regulator to obtain operating voltage of 7.4. DO NOT EXCEED 7.7 VOLTS UNDER ANY CIRCUMSTANCE. Adjust current regulator to obtain charging rate of 42. amperes. If adjusting screw is turned clockwise beyond normal range required for adjustment, the spring support may be bent so that it fails to return when pressure is relieved. If this happens, turn the screw counterclockwise until sufficient clearance exists between screw head and spring support, then bend spring support upward carefully until contact is made with screw head. Make final adjustment as described above. After adjustment of either regulator unit, install cover and gasket, bring regulator up to operating temperature and recheck calibrations starting with step 13 above. Upon completion of all tests and adjustments, disconnect regulator test equipment and reconnect battery wire to “BAT” terminal of regulator. Before starting engine, momentarily bridge between the “BAT” and “GEN” terminals with a screwdriver to polarize the 1951 Buick generator. Set engine idle speed at 450 RPM, then disconnect tachometer. The following procedure covers use of the Allen Volt-Ampere Tester, Model E-302, in making tests and adjustments of the cutout relay, voltage regulator and current regulator in the order named. REGULATOR COVER MUST BE IN PLACE DURING ALL TESTS. Turn volt-ampere tester “SELECTOR” switch to “10V”, turn “GROUND” switch to “NEG”, and insert the BLUE plug of the 100 AMP. SHUNT into the “AMPS. ONLY” socket. Disconnect wire from regulator terminal marked “BAT” and attach flexible lead of 100 AMP. SHUNT to the “BAT” terminal of regulator. Attach the disconnected battery wire to opposite end of the SHUNT. See figure 10-21. Insert RED plug of voltmeter lead into “VOLTS & AMPS” socket of tester, connect YELLOW clip of lead to regulator terminal marked “GEN”, and connect BLACK clip to ground on base plate of regulator. See figure 10-21. Connect jumper wire between terminal marked “F” and ground on base of regulator so that voltage regulator cannot operate. This is advisable because an improperly adjusted voltage regulator may prevent the cutout relay from closing. Start engine and warm it up until it is running on slow idle and adjust speed to 350 RPM. CAUTION: N ever run engine faster than 1400 RPM with “F” terminal grounded. A higher speed may cause damage to generator. From slow idle slowly increase engine speed and note voltmeter reading at instant that cutout relay contacts close, indicated by movement of ammeter hand from zero. The voltmeter will read between 5.9 and 6.8 volts if closing voltage of relay is correctly adjusted. Gradually increase engine speed until generator is charging approximately 5 amperes. Slowly reduce speed until relay contacts open, indicated by ammeter hand returning to zero. Contacts should open on reverse or discharge current; if contacts open when ammeter shows charge it indicates a shorted relay winding requiring replacement of regulator. If ammeter does not return to zero after showing discharge current the relay contacts are sticking, requiring removal of regulator and adjustment of a:ir gap, (par. 10-30). If relay closing voltage is not between 5.9 and 6.8, remove regulator cover and adjust relay armature spring tension to obtain closing voltage of 6.4. Adjusting screw has a left-hand thread, therefore turning screw clockwise increases spring tension and closing voltage; turning screw counterclockwise decreases closing voltage. See figure 10-20. After adjustment, install cover and recheck closing voltage. CAUTION: Never close relay contacts by hand with battery connected to regulator because this will cause a damaging high current flow through regulator units. After cutout relay closing voltage is correctly adjusted, shut off engine. Remove jumper wire from “F” terminal and disconnect 100 AMP. SHUNT from regulator, battery wire, and tester. Leave battery wire disconnected from regulator. Turn “SELECTOR” switch to “REG” position, leave “GROUND” switch at “NEG” position, and turn “REGULATOR” switch to “6V” position. Connect YELLOW clip of voltmeter lead to regulator terminal marked “BAT” and leave BLACK clip connected to ground on base plate of regulator. See figure 10-22. CAUTION: Since the voltage and current regulators are compensated for temperature, the following tests must be made with regulator at operating temperature to insure accurate results. Cycle the regulator by gradually reducing engine speed until cutout relay contacts open, then bring engine speed back to approximately 1500 RPM. The voltmeter reading will indicate the operating voltage, which will be between 7.2. and 7.7 if voltage regulator is properly adjusted. The ammeter will show a generator charging rate of 8 to 10 amperes. NOTE: If no ammeter reading is obtained, check the 14 ampere fuse in tester. Increase engine speed to 2000 RPM, then depress the “REGULATOR TEST” button and note ammeter reading. Ammeter will read 40-46 amperes if current regulator is properly adjusted. Reconnect the 100 AMP. SHUNT as shown in figure 10-21, but do not connect the jumper wire nor the voltmeter lead (yellow and black clips). If either the voltage or current regulator did not operate within specified limits, remove regulator cover and adjust armature spring tension as required. Turn adjusting screw clockwise to increase operating voltage or charging rate; turn counterclockwise to decrease operating voltage or charging rate. See figure 10-19. The final setting must always be made by turning screw clockwise to increase voltage or charging rate-never by turning screw counterclockwise. Adjust voltage regulator to obtain operating voltage of 7.4. DO NOT EXCEED 7.7 VOLTS UNDER ANY CIRCUMSTANCE. Adjust current regulator to obtain charging rate of 42 amperes. Upon completion of all tests and adjustments, disconnect tester and reconnect battery wire to “BAT” terminal of regulator. Before starting engine, momentarily bridge between the “BAT” and “GEN” terminals with a screwdriver to polarize the generator. The contact points of a 1951 Buick regulator will become oxidized and pitted after extended service and require cleaning. Contact points also may be burned because of faulty connections in the charging circuit, shorts or grounds in the generator field circuit, or installation of a radio bypass condenser on the “F” terminal of generator or regulator. The majority of regulator troubles arise from dirty and oxidized contact points, which cause a reduced generator output. Cleaning of contact points, or replacements if badly burned, followed by adjustment of air gap and spring tension will correct faulty regulator operation in most cases. Cleaning of points and adjustment of regulator should not be attempted with unit on the car; remove regulator so that this work can be done properly. Loosen the upper contact support mounting screws on voltage and current regulators and tilt support to one side so that each point can be cleaned separately without danger of bending the upper contact spring. Use a thin, fine-cut file on the crowned point on contact support, and use a spoon or riffler file to clean out the cavity which is usually formed in the flat contact point on the armature. See figure 10-23. A flat file will not clean out this cavity. File just enough to remove oxidation. N ever use emery cloth or sandpaper on contact points since particles of emery or sand left on point s will cause them to arc and burn. After contact supports are returned to position, reset air gaps (subpar. d, below). If new upper contact supports are required or if supports have been removed, they should be installed as shown in figure 10-24. Note that the connector strap is connected to voltage regulator contact support but is insulated from the current regulator contact support. Note position of the flat and tubular insulators. After installation of contact supports, reset air gaps (subpar. d, below). 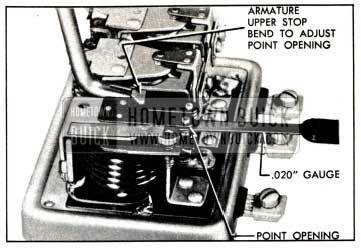 The 1951 Buick cutout relay requires three checks and adjustment: Air gap, point opening and closing voltage. Place finger on armature directly above core and move armature down until contact points just close. If both sets of points do not close simultaneously, bend spring fingers so that they do. With points just closed, measure air gap between armature and center of core; gap should be .020″, measured with feeler gauge. Adjust air gap, if necessary, by loosening armature mounting screws and raising or lowering armature as required. Tighten screws securely and recheck air gap. 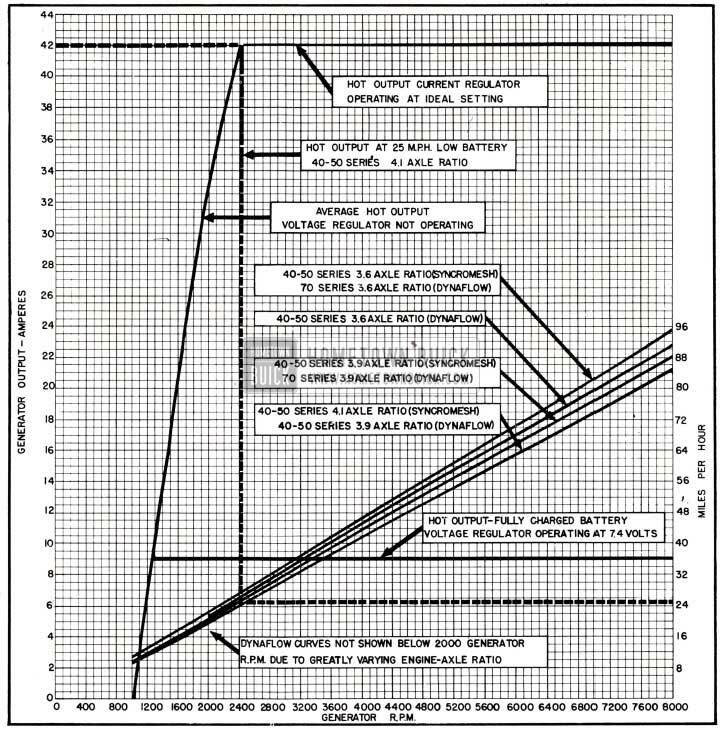 See figure 10-25. Check contact point opening with feeler gauges. Opening should be .020″. Increase or decrease point opening, if necessary, by bending the upper armature stop. See figure 10-26. Check and adjust closing voltage as described in paragraph 10-29, after installation of regulator on car, or while connected to a proper test 1951 Buick generator and battery. The voltage and current regulators require two checks and adjustment; air gap and voltage or current setting. Push armature down to the core and slowly release it until the contact points just touch, then measure air gap between armature and center of core, using feeler gauge. Air gap should be .075″. Adjust air gap on each unit, if necessary, by loosening contact support mounting screws and raising or lowering support as required. Be sure points are lined up when tightening screws, then recheck gap after adjustment. See figure 10-27. Check and adjust voltage and current settings as described in paragraph 10-29, after installation of regulator on car, or while connected to a proper test 1951 Buick generator and battery.